Buzz Kill Ramblings of Tim Louie: SNOW ON YOUR CAR AND RECEIVE A FINE! SNOW ON YOUR CAR AND RECEIVE A FINE! For many of us, it's my least favorite time of the year. It's snow season. With that comes shoveling, snow blowing and plowing. It means we have to clean off our cars of all the snow that fell the night before....or do we? Many of you are too damn lazy and don't clean your cars off at all, which is a danger to many others on the road. We get sometimes you're in a rush and don't have the time to clear it off, but it needs to be done. Especially, when it hardens up and turns into a sheet of ice. I had a friend who was driving behind a truck who didn't clear off their car, the wind picked up that sheet of ice and it slammed on her windshield and cracked the whole entire thing. 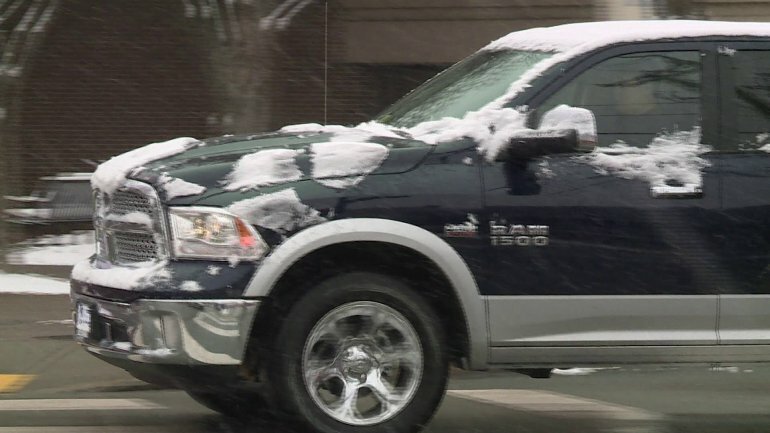 That being said safety groups are warning drivers to make sure they clear the snow and ice off of their vehicles before driving on roadways in Virginia, and one state lawmaker has even proposed a law that would fine drivers who fail to do so. I think that's brilliant, but also thought it was already a law. HB 207, introduced by delegate Mike Mullin from Newport News, VA, would allow police to write a $100 ticket if a person drives a vehicle "with any amount of accumulated snow or ice on its exposed surfaces where, were the snow or ice become dislodged from such vehicle, such accumulated snow or ice could interfere with the operation of another motor vehicle or cause injury to persons or property." Mullin said, "Every person I've spoken to said, 'thought this was a law already.' It's what they teach you when you go and get your license to begin with. It's what VDOT and DMV recommend. This is something that is just common sense." A personal experience on Interstate 64 during the first snow storm this winter led Mullin to file the legislation. He said, "I had a car in front of me didn't clear off the top of the car at all, didn't clear off the back, and when it all came off in a big sheet, it darn near killed me." Several northern states, like Connecticut, New Jersey, and Maine, have laws that fine drivers for not clearing snow off their vehicles. I thought we had that law here in Jersey! In Virginia, cases of body damage done to vehicles by sleets of ice flying off other vehicles have been reported. In other states, snow and ice flung from vehicles have resulted in traffic fatalities. Then again, does Virginia get as much snow as we do up this way? They might now with this Global Warming! Bottom line is it's bad! This is your public service announcement for today! Clean your cars off when it snows. It literally takes 5 minutes. You could be a danger to someone else and you wouldn't even know because you're just driving. You don't care what happens behind you. Clean that crap off! FOR THE LADIES....YOUR BIONIC MAN IS HERE! BAD CASE OF BLUE BALLS?